The original Sound of Music has been a long time tradition around our home. My husband even has a couple of the songs on his iPhone! I was thrilled to hear that a wonderful recording artist like Carrie Underwood was going to help bring this classic back Live! 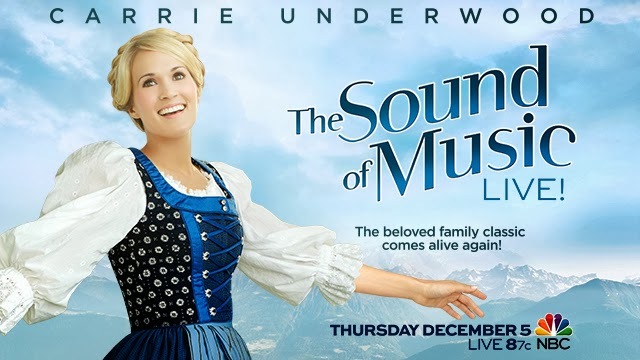 From executive producers Craig Zadan and Neil Meron ("Smash," "Hairspray," "Chicago") comes an instant holiday classic: "The Sound of Music," based on the original Broadway musical. Carrie Underwood and Stephen Moyer star as Maria and Captain von Trapp in this beloved story of the young novice who falls in love with Captain von Trapp and his seven children, set against the backdrop of Nazi-occupied Austria. The jewel in the Rodgers and Hammerstein crown, "The Sound of Music" contains some of the most famous songs ever written for the stage, including "The Sound of Music," "My Favorite Things," "Do-Re-Mi," "Sixteen Going on Seventeen," "Climb Every Mountain" and "Edelweiss." This new version of "The Sound of Music" will be a faithful adaptation of the original stage musical, to retell the story for a whole new generation. And more than that, it will be broadcast LIVE, adding a whole new level of immediacy and excitement. Get ready to reintroduce your family to the most joyful, most emotional and most musical family adventure of them all. We will be tweeting all of the great things we love that night while we share this new holiday tradition as a family!